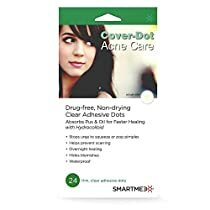 Cover-Dot Acne Care treats blemishes by absorbing oil and pus. Unlike other products with the same design (hydrocolloid), Cover-Dots are THINNER and have tapered edges that keep the product in place. Cover-Dots reduce blemish size and redness without drying out surrounding skin. It also protects blemish and acne from external contamination and irritation. Provides UV protection. STOPS URGE TO SQUEEZE ACNE OR BLEMISH. Cover-Dot Acne Care is drug-free and made in the USA. What is hydrocolloid? Cover-Dot adhesives uses hydrocolloid, which promotes faster healing by absorbing oil and pus that are the main cause of acne. The gentle yet effective design absorbs fluid from blemishes while the thin, adhesive patch keeps the dots in place. Cover-dot works most effectively when blemish or acne is already developed, as the hydrocolloid absorbs pus and oil from acne blemishes. Box contains Round, 0.5-in dots per box – 12 dots per perforated sheets for easy peeling. MADE IN USA.